In my last CSA pick-up, I received a gigantic zucchini that could have fed an army. I asked around for ideas for using it in multiple dishes. Someone on Twitter mentioned that when his zucchini get that large, he feeds them to his animals. I can understand that given that at this kind of size there are bigger seeds and the texture is starchier, but I was determined to make good use of this monster for human consumption. In the end, I chopped some of it and roasted it for a pasta dish, and for the rest, some sort of zucchini bread was a no-brainer. A quick bread is a good way to go with a big, starchy zucchini because it’s grated before being mixed into the batter, and the texture matters less that way. 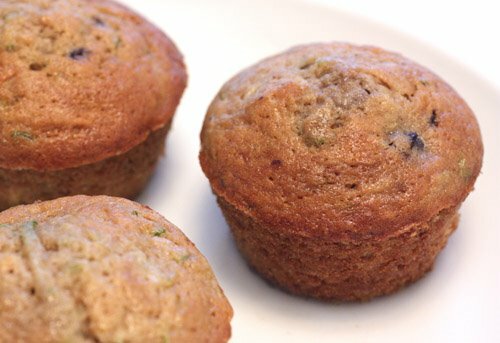 After looking at a few options for zucchini bread, I came upon a recipe for muffins in Martha Stewart's Baking Handbook . In the book, these are actually cranberry-zucchini muffins, but I used cherries because that felt summerier. This is a very quick muffin batter to assemble. The great big half of zucchini was grated and set aside. Eggs, sugar, oil, and vanilla were whisked together, and then the zucchini was added. Flour, baking powder, baking soda, cinnamon, and salt were incorporated before frozen cherries were folded into the batter. Into the oven went the muffins, and they emerged golden with little, green flecks. I liked seeing the bits of green from the zucchini just to remember that it was in there. It’s, of course, completely imperceptible in the flavor, but it does a magic trick on the texture. This is a muffin that can sit for a few days and still taste just as tender and delicious as the first day thanks to all that grated zucchini. These muffins also freeze very well, and I’ve already pulled the second half of the batch out of the freezer to finish them. This size of zucchini wouldn’t be a good choice for a raw salad or for pickles, but it did make some very fine muffins. Those muffins are wonderful"A great combo! Third time this week we've seen cherries used in a way never seen before. Of course they'd go well with zukes though. Zukes do wonders in baked goods. Ooo...Delish and healthy. That reminds me I still have a zucchini in the fridge. I can't believe I almost forgot about that!! Eek! I absolutely love gigantic zucchini! They make me feel so bountiful! 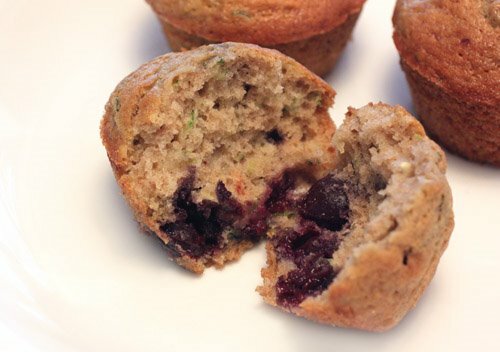 Delicious muffins, a great way to use up the surplus zucchs and cherries! Truly unique muffin. I never made anything like this. I heard about Zuke bread, I heard it's delish too. I can imagine this muffin is also delish! How creative - these look beautiful. When I have a big honkin' zucchini I'm inspired to add some grated to stuffed grape leaves. Even when starchy it adds wonderful moisture and texture. cherries and zucchini? Who would have thought? Sounds so nutritious and delicious, though! I would of never thought to use cherries with zucchini. I love it! Absolutely delicious combo. What a unique combination of ingredients in this delicious muffin! Love cherries! I am currently in zucchini glut from my veg box too. Great idea - I love the addition of the cherries. Sounds like a great combo! I made zucchini bread once and the cherries sound like a great addition! What a cool flavor combo, I wouldn't have thought to add cherries to zucchini bread - it sounds delicious! I like the idea of zucchini in muffins as opposed to bread. And the cherries do make it more in tune with the season. They look like a perfect treat to wake up to in the morning. I like the use of the cherries. Two things I have lots of, zucchini and cherries. Perfect. Oooh, I love how colorful they are! gotta love zucchini for that. This looks like a great way to use up lots of fresh zucchini that I have in my fridge. Sounds great! This sounds like a great combo. You see so many zucchini breads and muffins but I love the addition of the cherries. I actually have a bag of frozen cherries that I have been thinking about how to use up. This is awesome. My neighbour has numerous gigantic zucchinis because they were not picked on time when they have gone on holiday. They asked me to take them if I like and I had no idea when to do with them. One idea was to make pasta sauce but your muffin idea is just perfect !